One victory apiece, one defeat apiece - Greece and Belgium were neck-and-neck heading into the third round of Junior Boys' Team group stage fixtures at the STAG 2018 European Youth Championships in Cluj-Napoca. Plenty was riding on the outcome of the tie with the winning side gaining automatic qualification to the Round of 16 and after a dramatic battle which went right down to the wire it was Belgium who took the plaudits on Monday 16th July. Two matches into the tie and nothing could separate the two teams: the Belgians struck first through Laurens Devos, who saw off Ioannis Damians with little difficulty (11-7, 11-8, 11-5), but Greece responded well with Ioannis Sgouropoulos defeating Olav Kosolosky (11-8, 11-9, 16-14) to level the proceedings. David Comeliau and Ioannis Sgouropoulos overcame challenges from Michail Diamantopoulos (11-5, 9-11, 11-5, 11-9) and Laurens Devos (11-8, 17-15, 11-4), contributing further wins for Belgium and Greece respectively to send the tie into a deciding fifth encounter. Experiencing defeat earlier in the match but Olav Kosolosky was the hero at the close of the tie, beating Ioannis Damians 3-0 (11-8, 11-1, 11-9) to send Belgium through as group runners up behind France. Following a successful outing on day one Russia has extended its winning run to three, prevailing 3-0 over the Czech Republic: Vladimir Sidorenko’s straight games victory against Radek Skala (11-4, 11-9, 11-7) resulted in an early lead for last year’s runners up before back-to-back wins courtesy of Maksim Grebnev and Lev Katsman finished the job. Germany, the team that beat Russia to the 2017 title, progresses from Group C in second place. Poland has edged through to the last 16 after securing the runners up spot in Group A thanks to a mini-comeback from 1-2 down, beating the Slovak Republic 3-2. 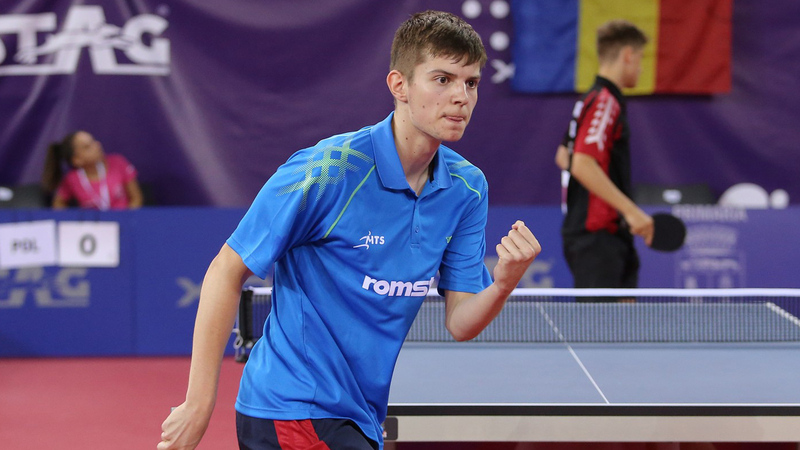 The host nation line-up of Rares Sipos, Cristian Pletea and Dragos Florin Opera secured their sixth point of the group with a dominant 3-0 display against Turkey, sealing top spot in the process. In Group D Italy ended its group stage campaign on a positive note, accounting for Slovenia 3-0 but it was only enough to guarantee second position in the group as Sweden’s Martin Friis, Truls Moregard and Bruno Nettarp emerged as the victors against final opponents Spain. 2018 STAG European Youth Championships Ioannis Sgouropoulos Vladimir Sidorenko Olav Kosolosky.